Policy proposals go up for debate, as new study shows how big Airbnb is across city neighborhoods. A new policy analysis commissioned by the Board of Supervisors examined 6,113 Airbnb listings to study how short-term rentals impact the housing market in neighborhoods across the city. It comes ahead of a Supervisors meeting this coming Tuesday that will consideropposing ways for measuring and regulating the young industry. Most of the discussion of the report, which was released at the May 18 Supervisors meeting, has focused on the Mission, and related topics like the proposed moratorium on development there. But the data from the report also reveals the significance of Airbnb for other neighborhoods. Commissioned by Supervisor David Campos of District 9 (which covers most of the Mission), the study also looked at how effectively a February ordinance on short-term rentals is being enforced and whether gathering additional data or amending the ordinance would be effective. Its findings concluded that short-term rentals remove a small percentage of overall housing, that neighborhoods with the most Airbnb listings also have high eviction rates, and that 1.9 percent of tourists now home-share instead of booking a hotel. Neighborhoods that saw the highest reductions in vacant for rent housing were Haight-Ashbury/Western Addition, Inner Mission, Potrero Hill/South Beach and Castro/Eureka Valley. Citing a 2013 report that the city had 8,413 vacant housing units, the study estimates that Airbnb rentals account for 11.0 to 23.2 percent of vacant units citywide. In Haight-Ashbury/Western Addition, the study reported that Airbnb listings take up 31.9% of the total potential units for rent. During the month studied in the Inner Mission, Airbnb offered 199 entire-unit listings, more than twice the number of new housing units (85) the Planning Department says were created there in the entire year. The study differentiated between casual hosts, people who list their home on Airbnb from time to time, and commercial hosts, “who probably do not live or could not live” in their home unless they rented it out for the income it provides. The report concludes that Airbnb’s commercial hosts are removing 925 to 1960 housing units from the market, or 0.4 to 0.8 percent of the city’s 244,012-unit inventory. The listings data was scraped from Airbnb’s web site in December 2014. At the meeting, Campos said that he supports home-sharing, but “probably something that all of us could agree on is that the existing law is not working. The system is broken.”By the time the report was released last month, only 579 units had been provided to the city’s short-term rental registry – a large portion of people who rent spaces out on Airbnb were not following the ordinance. Campos has put forth a proposal co-sponsored by Supervisors Eric Mar and John Avalos to require sites listing short-term rentals to only accept units on the city’s registry and compel Airbnb and others to share personally identifiable information about hosts and bookings. A correlation between neighborhoods with high Airbnb listings and high eviction rates was revisited several times during last month’s hearing. The San Francisco Rent Board reports that the Inner Mission saw 323 evictions in 2014, 12% of the city’s total; in December, the neighborhood had 315 commercial hosts on Airbnb. In Russian Hill/Polk Gulch, the second-highest ranked area for evictions, there were 130 commercial hosts and 269 evictions.According to the Budget and Legislative report, its estimates are conservative because Airbnb’s listings represent only a segment of the overall home-sharing market. Established companies like VRBO have been providing home vacation rental sites for many years. The report sourced statistics about the city’s overall housing stock and vacancy rates from 2013 data gathered by the US Census Bureau. Campos’ proposal includes all of the report’s recommendations, calling for a cap of 60 host-days per year and levying a $1,000/day fine against companies that offer units not listed on Planning’s registry. 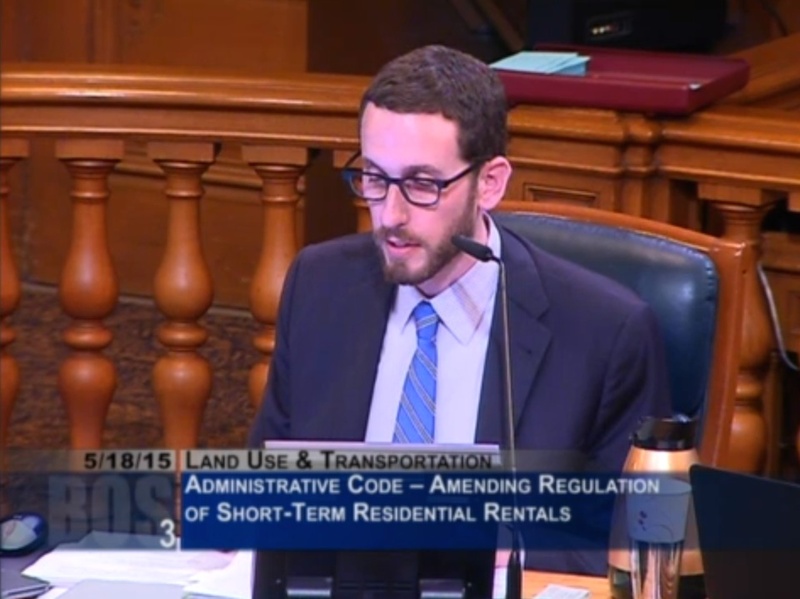 Legislation offered by Supervisor Mark Farrell seeks a 120-day cap, no differentiation between hosted and unhosted listings and would create a new Office of Short-Term Rental Administration and Enforcement. Farrell said requiring rental platforms to provide the city with details about hosts and bookings would create a “dangerous policy precedent around handing over personal and sensitive information to the government,” comparing the idea to a GPS app that flags authorities if users exceed the local speed limit. Farrell said new adding new rules now will have “the opposite effect that was intended” by “driving hosts underground.” He said his proposal will incentivize hosts to sign up for the short-term rental registry by streamlining the process, adding that it was unfair to target Airbnb when there are a number of other companies offering near-identical services, such as Flipkey and VRBO. Supervisor Scott Weiner expressed concerns about host privacy and stricter enforcement. It’s not clear if either Campos’ or Farrell’s proposal will clear the entire board in Tuesday’s vote, but activists on both sides are laying the groundwork for a November ballot proposal; a group called Sharebetter San Francisco is reviving a movement from last year to enact new rules that create stronger enforcement mechanisms for home-sharing companies and collect the same 14% hotel tax from Airbnb visitors pay at downtown hotels. Airbnb is promoting San Francisco’s Home Sharing 11, a group comprised of hosts gathered from each of the city’s electoral districts. In an open letter to the Board of Supervisors, the group claims that more than 75,000 city residents have been Airbnb hosts, and that the income they generate via the platform makes it possible for them to remain in San Francisco. The policy study was one of the first quantitative looks at the impact of home rentals on the limited supply of city housing. But for now, one can only speculate how individual neighborhoods besides the Mission might be impacted by either of the dueling solutions. Would the price of rent or the number of evictions in the Castro or Upper Haight substantially drop if either passes? Maybe. And yet, with the international demand for Bay Area housing and the overall low numbers of new units being built anywhere in the nine-county region, its hard to see any policy tool available to the city solving the overarching housing shortage. In the meantime, Airbnb is pushing ahead. For example, along with being a Pride sponsor this year, it is offering a $500 credit to any city resident who lists an accommodation this month (provided they have not rented out through the company before). Tuesday’s Board of Supervisor’s vote on amending short-term housing regulations will be held at 2pm in Room 250 of City Hall. To watch a live stream of the proceedings, go to SFGovTV. Sari Staver contributed reporting to this article.